On March 5, 1919 the club received its charter from Kiwanis International. Elwood J. Turner was the first president. In 1921 the club created the Kiwanis Service Metal award given annually to an outstanding person who had rendered the largest free service to the community. Hugh Ward 1932, Charles Larkin 1943, George White 1957, Rev. Dave Macqueen 1962, Dr Clarence R. Moll 1965 and Ray Diament 1968 were Kiwanians that were honored to date. A basketball tournament among high schools of Delaware County was started in 1923 and became one of the outstanding athletic events in the State. Profits from this tournament were a part of the foundation for the Kiwanis Objectives Fund which supports the Kiwanis Eye and Tonsil Clinic, monthly parties at the Neuro-Psychiatric Ward (Valley Forge Hospital), sending children to summer camp, providing scholarships at PMC and a Christmas party for adult cerebral palsy victims. In 1928 the club started it's K. B. F. ( Kiwanis Builds Forever) awards given to outstanding graduates from Chester and St James high Schools. In 1938 we added Police Day. A meeting was set aside to pay tribute to these men who risked their lives to protect our lives and property. After World War II, a Veterans Information and Advisory Service was established to assist the veterans in their return to civilian life and make their rehabilitation easier. 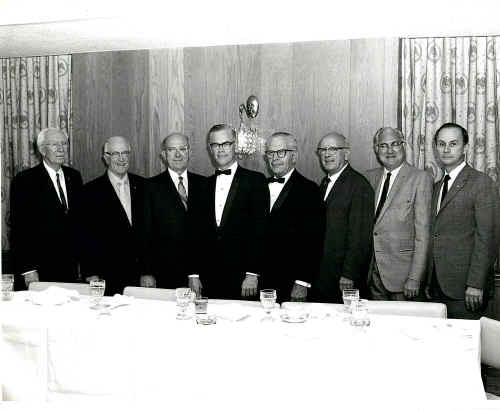 In 1947, the Key Club of Chester High School was formed and since 1948 the club has sponsored and financed one of the Report Luncheons of the Community Fund. In 1949 our club erected "Kiwanis Hall" at Camp Sunshine. Built several cabins and enlarged the dining hall. Each year the club sends children for a 3 week summer session camping experience. In 1960 our club built a swimming pool at the Delaware County Cerebral Palsy unit at 21st and Hyatt Sts. This represented an outlay of nearly $10,000 in hired labor and materials. In 1961, Bob Vaughan and John Kriebel organized the first of our High School Stage Band contests. A competition among 10 bands that is held annually at Sun Center. In 1962 we sponsored our first Pancake Day and in 1964 we adopted the Wheel Chair program and have 14 wheel chairs on loan free to persons who need them. Some members have served in higher offices of Kiwanis International. Elwood Turner served as Governor of the Pa District in 1920 and Clarence Conner was Governor in 1937. Those who have served as Lieutenant Governors are Clarence Conner, Paul Palmer, Lister Armstead, Newlin Palmer, and Robert Vaughan. Elwood Turner was elected to the high office of Vice-President of Kiwanis International in 1924. The Kiwanis Club of Chester has and will continue to follow the Kiwanis' Motto, "We Build"
© 2000, 2001, 2003, 2006 John A. Bullock III.